Do you have a 3rd-5th grade blog? 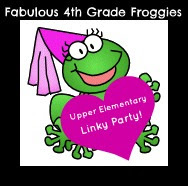 Visit Lorraine at Fabulous 4th Grade Froggies and link up... or blog stalk a bunch of us. Just found your blog! I am your newest follower. Come over and visit my blog when you have a chance. Hi, I just joined your blog through the 4th Grade Linky party. I love your site. I'm excited to explore your blog and read your wonderful ideas. Cute site! Love the title! I love your blog. I found you thanks to the Linky Party. It would be great of you can stop by in mine!!!!!! !